Sleeping up to six guests, our large bungalow is like a grand hobbit house. We have three guest rooms available for B&B at weekends, each sleeping two and bookable individually or all together. This listing is for our premier room! It has a big, round, queen sized bed and an en-suite bathroom. Newly decorated, and up a single flight of stairs, this large room has a pine polished wooden floor and a scandi vibe. The views are in three directions and the sea is visible (just!). You have a spacious en-suite bathroom, sparkling white with scarlet mats. You'll have full use of the large communal space downstairs with the large guest lounge featuring the biggest bean bag you've probably ever seen and two red settees; in the adjacent open plan dining area is a six seater dining table just off the large traditional kitchen where you can help yourself to tea and coffee. Downstairs we have two more guest rooms: a double with private shower room, and a twin room with its own large, retro bathroom. Each room is listed individually and can be booked separately. You can find all the room listings easily by searching for B&B Hove, UK on this site. All three rooms can be reserved together through a single, separate listing. Please note, this is also our home. We have a private area but we're on hand to point you to all the best places, transport and restaurants. We'll also provide you with a simple but beautiful breakfast - it's included! There's a choice of cereals or porridge, toast, croissants and jams, choice of a dozen teas and real coffee, and the best orange juice, all served at a time that suits you (but before 10.30am!). The rooms may be rented individually or all together; if individually, then you may share the communal areas with other guests. Our neighbourhood is Hove Park. It's residential but only a mile from the sea front and not much further from the Brighton city centre, Hove is only half a mile. We're on several bus routes and very near all the main routes into and out of town. We have plenty of free parking on the street and we're walking distance from Hove station. Our guests love the convenience of the location, the quirkiness of the house and the peaceful surroundings. You can store your cold food or drinks in the fridge. We love to chat to guests to make them feel at home but you have some personal space with your own guest lounge. You'll have a key to come and go as you please and can access the gardens which are all around our detached property. We only have a few rules: We respect others' privacy and come and go quietly after 10.30pm. We leave the kitchen as we find it - pristine! Guests may make hot drinks and use the fridge but cooking is not permitted. Landline phones are not for the use of guests. Please, no outdoor shoes to be worn in the house. Groups should note that we don't allow partying or loud music even if you've booked all three rooms, sorry! Nor do we accept visitors who are not staying (unless by prior arrangement) or pets, and we're a smoke free zone. Earliest check in is 2pm and check out by 11am. Please note that the boutique character of the space makes it better suited to adults. We do have free broadband wi-fi and each room is equipped with a guide to the area and a bus timetable. We also offer an indie guide to hundreds of local small businesses and literature supporting the best local sites to visit. Our children have flown the nest and now we have this super, big house all to ourselves. We've three spare bedrooms and bathrooms so it makes sense for them to earn their keep! So we do B&B at weekends - and we've been thrilled at the enthusiastic response from our guests. We've been active for more than two years now and have welcomed guests from every continent except Antarctica! Our eccentric home appeals for its hobbity exterior and its surprisingly contemporary and spacious interior - Tardis like, to Dr Who fans. Every room has its own bathroom, all are different in character, one even has a big round bed for people... who get around. 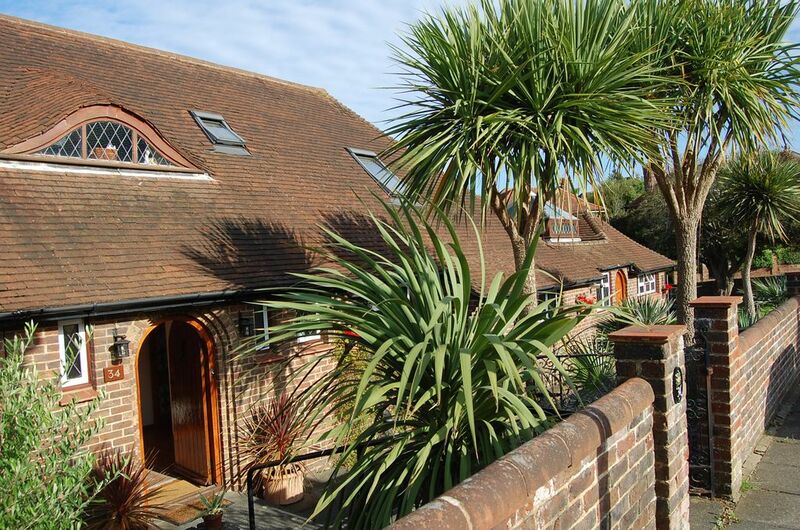 Character, peace, quiet and parking for free but only a mile from the sea and the attractions of the city centre, and not much further to the South Downs and the Sussex countryside. Very few B&Bs can match our quirky eclectic mix of luxury and character. As this is our home our guests receive a sense of genuine hospitality. This room has a fab modern all white ensuite with scarlet mats and fluffy white bath towels. You can see the sea from your room (just)! We're about a mile from the beach. The good news is you can park for free! No use of landlines for guests. Big bath towel each. Also hand towel per bathroom. Dishwasher provided and owners on hand to empty. We do it for you at breakfast - otherwise, varieties of instant. Hosts on hand to operate this complex piece of equipment. We serve you a beautiful but simple breakfast of orange juice, coffee and a choice of teas, porridge or a selection of cereals, toast and usually a choice of croissants, bagels or muffins. Some in your room and lots more in the 'library'. Gardens on 4 sides, accessible via locked gate but freely available to guests. Available in the summer for rent in Brighton. Storage possible for up to 2 bikes. Cycle tours offered by prior arrangement and 1 spare bike free. Brighton has plenty available for sale and rent. At least 4 courses in the area. Guests can help themselves to a variety of teas and coffees as well as use the fridge for storing their own cold drinks. We loved the Hobbit House. Such a welcoming and cosy place. Geoff was a fab host. All the comforts of home and more were provided. Breakfast was yummy. I would heartily recommend anyone to stay here for a friendly, comfortable, and spotlessly clean base in the Brighton area. Thank you so much Lisa. I hope the rest of your trip is as pleasurable. We loved having you stay. The location and property were perfect for our stay. Geoff was a very attentive host and we would highly recommend this B & B to others. While only a brief stay, my family and I very much enjoyed the hospitality shown by Geoff and Lesley. We used all three rooms, which were all well appointed, comfortable and with separate bathrooms. Breakfast was a pleasant affair, with ample choice of cereals and continental-style options. The location was perfect for us and allowed easy access to Brighton and Hove. All in all very enjoyable. Thanks for your kind words Tim. You were ideal guests - come and stay any time! Brighton offers many other attractions including the famous Laines for up-market as well as quirky shopping, the Royal Pavilion and the pier, not to mention the nudist beach, the Brighton Festival, Comedy Festival and many other almost weekly gatherings of interest groups from far and wide from Pride to veteran vehicles to bikers and the annual deluge of cyclists on the London to Brighton bike ride.